It was just seventy seven years ago, in this week, that the great Ethiopian Military Hero who fought both at the battle of Adwa and the five years fascist era (1935 to 1941) died in battle fighting with fascist Italian invaders. His full name is Balcha Safo. But in Ethiopian tradition Kings and all other famous war lords are named after their favorite horse’s name or literally named as yeferese seme. Since Balcha Safo’s hores’s name is Aba Nefso, His full name with title included comes as Balcha Aba Nefso. 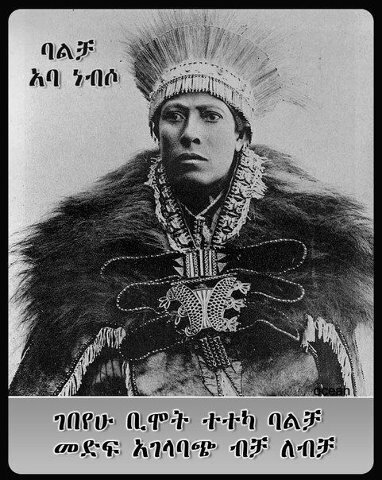 He is one of the most influential war lords of Emperor Menelik. He served the Emperor starting from his early age and in 1888 E.C he was honored as ‘Bejerond’ (A title and position in charge of governments’ tax and finances). Three years later he was appointed as the administrator of canon and ammunitions. The same year he participated in the great battle of Adwa where Ethiopian forces under the command of Emperor Minilik defeats the Italian forces. In that historic battle, as the famed Fetawerari Gebeyehu died in the battle, Balcha replaced that position and ultimately the victory; where the incident related beautifully through generations. Forty years later, when the Fascist Italian forces invade Ethiopia again in an attempt to cleanse off their defeat at Adwa, all those great Ethiopian Generals were not there at the time; most of them are died. But it was only the then old man Dejazemach Balch Aba Nefso who stands to the challenge and fought back the new fascist aggression again. After the fascist forces captured Addis Ababa, he made contact with other Ethiopian patriots and in collaboration they attached the fascist forces residing in Addis. After hours of fighting the Ethiopian forces retreated back to the Repi Mountain around Addis. Then the Fascist forces bombarded the mountain hold of the patriots from airplanes. From Repi Mountain, with his few loyal soldiers the old patriot then moves to Wechecha. The fascists tried to convince the old patriot to come to their side with different means. But this was a great insult to the aged patriot. He is reported to have said that “I don’t want to see Ethiopia under foreign forces. I would rather die than see this disgrace. What would I say to my lord Emperor Minilik when I died and met him in the Hereafter?” The fascist forces who learned the unflinching spirit of the aged patriot finally send a huge military force to burn down villages and if it is possible, ‘to capture Balcha Aba Nefso’. Seventy Seven years ago, on November 6, 2013 Balcha Aba Nefso with his small band of loyal soldiers fought with Italian forces. The old patriot and his mule were shot with machine gun bullets. Balcha was wounded on his leg. When the fascist soldier asked him to surrender, Balcha said to him to come nearer and take his hands. When the soldier approached him to capture the old patriot, Balcha swiftly grabs his gun and shot him. Angry and bewildered Fascist forces shot huge rounds of bullets on Balcha. Balcha Aba Nefso died as a hero. To commemorate this great Ethiopian military hero there exists in Addis a hospital named after him. And in the 1980s, in the Ethiopian National Theatre, a play entitled ‘Balcha Abo Nefso’ written by Birhanu Zerihun used to be staged for years. In the Ethiopian popular culture, Tedi Afro’s Album Tikur Sew relates, among all others, the brave undertakings of this great Ethiopian hero who fought with Ethiopian generation in defense of his country against foreign invasion.